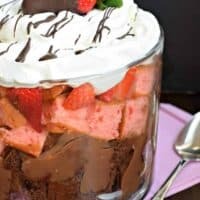 This Easy Neapolitan Trifle recipe can be put together in no time! Keep your layers of cake frozen until ready to use! You’re going to whip up this delicious Neapolitan Trifle in minutes. Thanks to keeping those layers of the cake (bring them out and slice them while frozen, they will make nice smooth cuts). 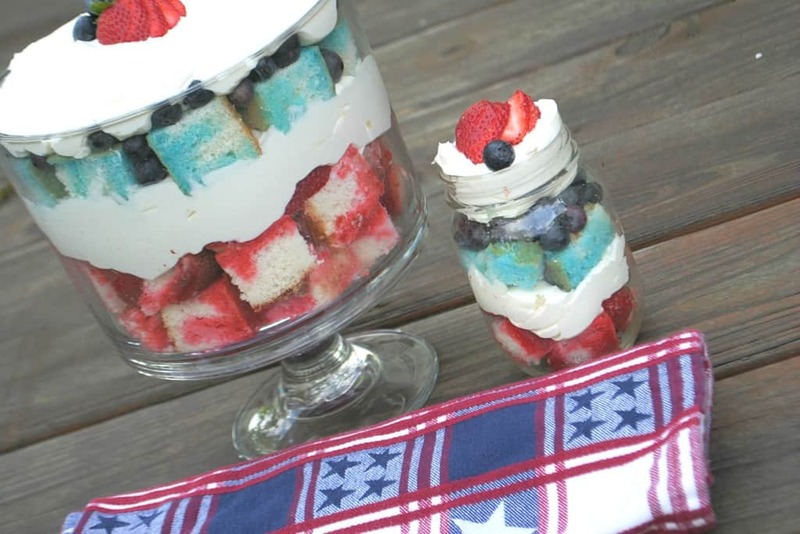 You can assemble this trifle and have dessert ready quicker than you know it! Do you ever find yourself in a “dessert emergency?” You know…you promise to bring something to a party, yet totally forget? Or even worse, the item you were supposed to bring, didn’t turn out. Or unexpected guests are showing up for dinner. Yeah. That just happened to me this week. A dessert emergency that involved me promising to bring lemon bars to a birthday party. I made TWO beautiful pans. I doubled a recipe and somehow messed up. They were the most disgusting thing ever. I wish I had these frozen cake layers in my freezer…waiting for me! Instead I made a box of brownies (don’t worry though…I “pimped” them out…recipe coming soon). Once you have your cake ready…whip up a box of chocolate pudding and slice some fresh strawberries. 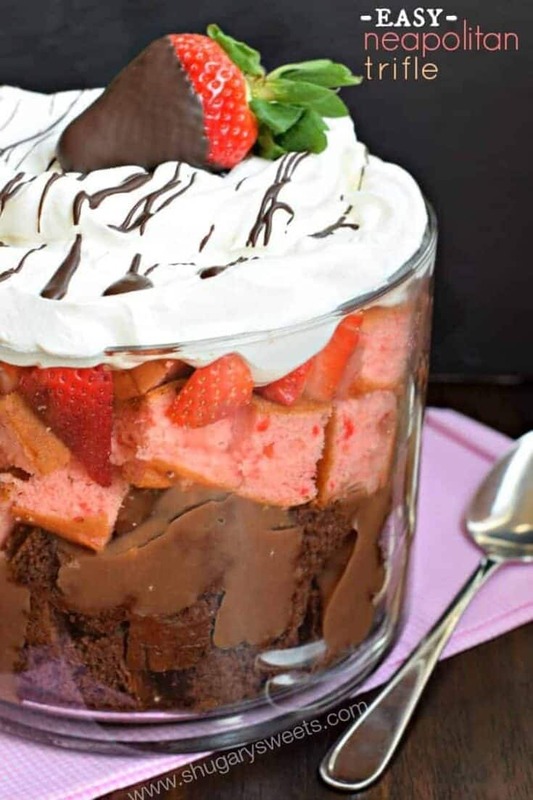 Layer your trifle with your cubed chocolate cake, prepared chocolate pudding, cubed strawberry cake, fresh strawberries and a tub of Cool Whip. 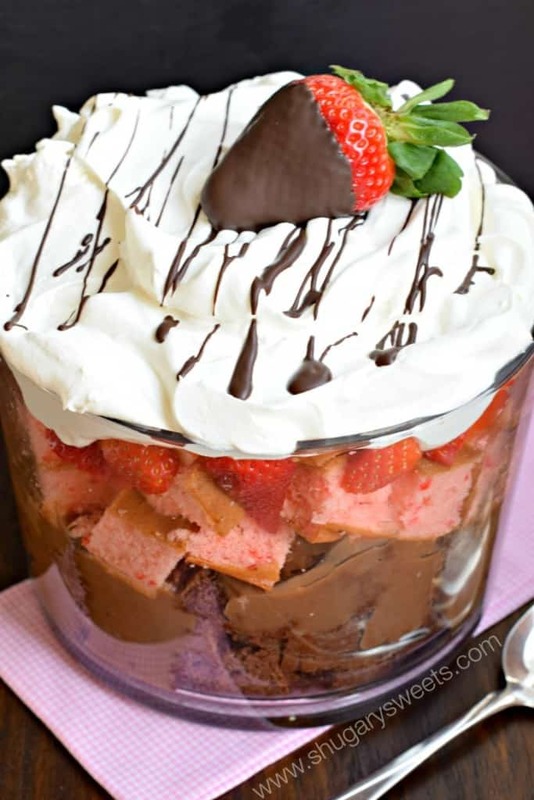 Delicious layered Neapolitan Trifle with chocolate and strawberry cake! Prepare cake mixes according to package directions in a 13x9 baking dish. Cool completely. You will only need HALF of each cake. You can put the remaining cake (cut into chunks) into the freezer for a later dessert. Prepare chocolate pudding mix with milk according to package. Allow to set up in refrigerator for 5 minutes. In a large glass bowl, lay your chocolate cake and pour the prepared pudding over the cake. Top this with the strawberry cake and fresh berries. 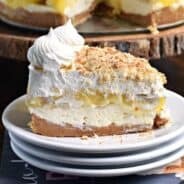 Cover the trifle in Cool Whip. Optional: dip one of the strawberries in melted chocolate as a garnish. Store in refrigerator until ready to serve. Keep in refrigerator for up to 3 days. ENJOY. Love trifles? Here are a few of my favorites…. 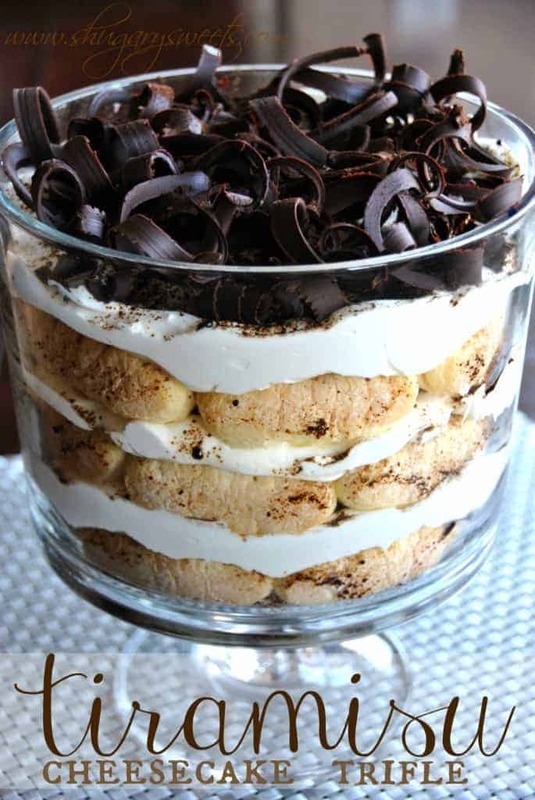 Tiramisu Cheesecake Trifle. Topped with a huge pile of homemade chocolate curls!!! 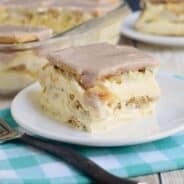 JELL-O Cake Trifle: one pan of white cake with gelatin. So delicious and refreshing! 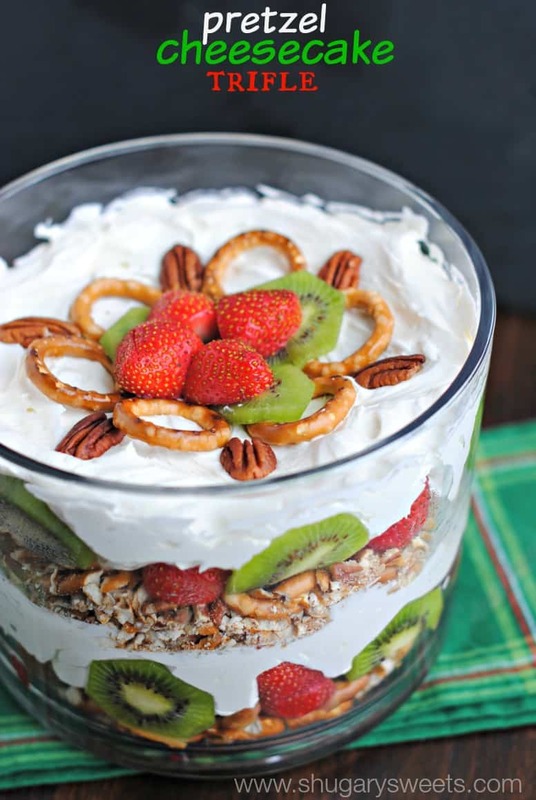 Pretzel Cheesecake Trifle: a stunning holiday dessert. Use any fruit in season! Totally in love with this — trifles are one of my favorites! They look so fancy Nancy but are so simple to throw together. Your flavor combo choice is perfect!! Your trifles all look awesome! And what would we do without brownie mixes? Lifesavers, for sure! I love the idea of keeping cake in the freezer for a dessert emergency! That is genius! This looks wonderful Aimee, I could just dig right in. Trifles are such an elegant dessert. I love how easily this comes together! Trifles are pretty much perfect for making a quick dessert that looks super elegant and hard, but took a few minutes. I love this variation! You are on a Neapolitan kick, lady! What an awesome idea. And I love Neapolitan flavors! This is so stinkin’ clever! I loooove it! Yummy! 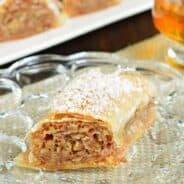 Love italian pastrys, I’m def gonna try this one! aimee i am loving this trifle! so festive for valentines day and oh so yummy to eat! It looks very tasty! My boyfriend would love it!